After several days of long flights and airline frustrations, I was on the Damai II steaming down the straits in Raja, after a wonderful late-afternoon dive full of vibrant undersea life by Batanta Island, I was getting a massage, drinking a Bintang beer, and enjoying the sunset. I reflected that all of these divers’ comments were right! It was pretty hard to beat! 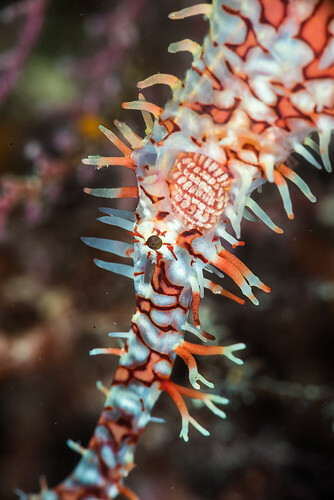 Over the next 10 days, eleven divers on the Optical Ocean Sales Photo Expedition concentrated their dives in the southern Misool area of Raja, as there had been wind and rain in the north. 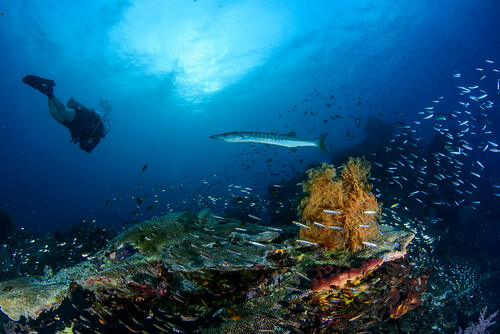 This is common in many areas in Indonesia, given that dive sites are so spread out; if the weather is bad in one place, another is fine. 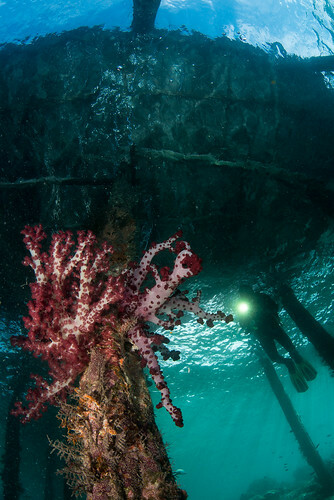 The Damai specializes in small dive groups, so we were spread out amongst 3 boats. I ended up staying with one guide, Salim, diving with another couple of divers who rotated through. 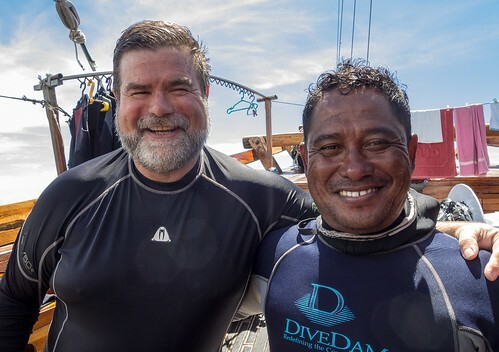 The other divers tended to go their own way a lot, so Salim and I ended up diving closely together most of the time. I’ve been diving with literally hundreds of other divers over the years, some are just fine, others you tend to have communication or other issues with. Human nature I guess. Salim and I settled into an easy rhythm. He spoke English, but we didn’t talk much between dives, other than to ID some weird nudibranch I’d never seen before, or to help him set up a GoPro he found on a dive. But we communicated underwater without difficulty, knowing what the other wanted, or where the other person was without guessing. During the course of some 30 odd dives spread out over 440 miles, there was no fuss, no muss. If we had a problem like my tank coming loose, we just dealt with it in a relaxed and purposeful manner. If I ran low on air at the safety stop, I’d grab his spare octo, without either of us even taking much notice. I used him many times as a model, and he was eager to learn, picking up on my directions easily. He loved to see the shots of himself and tried hard to improve his positioning. I could concentrate on my photography without worry. He always showed me great wide angle options, and was a master at pointing out macro critters as well. We’d get excited about a rare find and shared that enthusiasm underwater as I took photos. The unspoken communication between experienced divers was easy and robust. 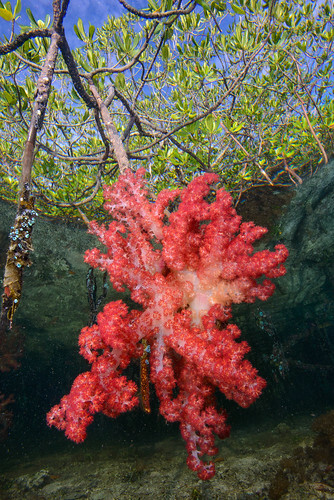 And there were special places like the Blue Water Mangroves at Nampale Island, where gorgeous soft coral grew in 2 feet of shallow water. 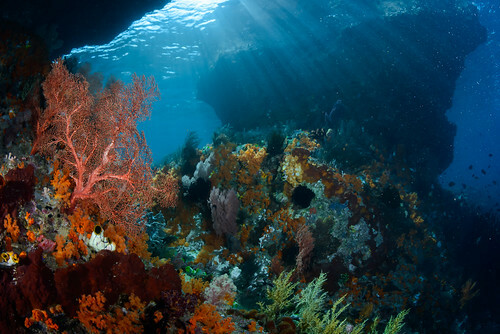 Or Window Rock, with the afternoon light streaming in onto fans and soft coral. 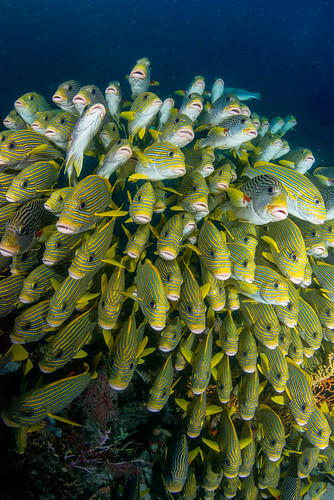 Or the huge schools of barracuda, snapper, and many other fish that challenged Salim and myself to move in close enough with them for photos. Moving to the north Dampier Straits area, the weather improved, but the visibility was more limited. Still, we had excellent diving - muck dives at Deer/Kofiau Islands, with wonderful afternoon lighting at famous Arborek Jetty. 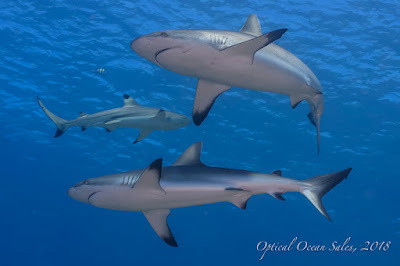 On a deep dive off Blue Magic, Salim showed me a few white tip sharks. As we went along the edge of the slope at 120’, we found a huge ball of hundreds of Sweet Lips, packed tightly together over a rock. Riding the current, I swam through them several times to take photos and they quickly regrouped tightly around me back into their school. Low on gas, and without much more than a quick fist pump to my chest, Salim led me back up the slope behind coral outcroppings to do deco and a safety stop. On our last day, we opted for a dive at Cape Kri. It wasn’t that impressive sort of a lot of rubble on a hillside, and I struggled to find something interesting to shoot. 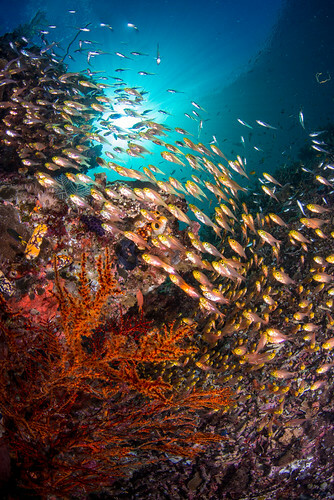 But then, at the end of the dive, in shallow water, was a bommie with fans and a huge school of glass fish swarming all over it. With the early morning sun streaming through clear, calm water I was able to take one of my favorite shots of the trip. Sometimes you just have to keep on shooting and trust that things will work out. No need to talk about it.